500' wire, flags & wire connectors. Each kit includes 500 feet of 20 gauge solid boundary wire, waterproof wire splices, and training flags to help your dog learn the boundaries. 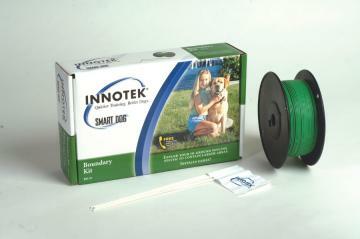 Can be used with any In-ground Pet Fencing System. Note: Picture is for viewing purposes. Product may differ than what is shown. Depending on supply, 20ga. solid wire other that Innotek's brand may be substituted.